A few years ago, cloud computing was just a nebulous term. Since then, however, cloud technologies have not only gained popularity, but they have revolutionized the way IT works. Cloud computing has made it cheaper and easier to experiment, research, and innovate. The pooling of many computers into one powerful entity, accessible via the Internet, has allowed things to be done at unprecedented cost and scale. According to the International Data Corporation, over the next six years, almost 90 percent of new spending on Internet and communication technologies will be on cloud-based technology. Considering the $5 trillion market involved, it is safe to say that cloud computing will generate major business opportunities in the near future. Companies investing in cloud-based innovation should take advantage of federal R&D tax credits to support their projects. Cloud computing has been defined as "the practice of using a network of remote servers hosted on the Internet to store, manage, and process data, rather than a local server or a personal computer". The National Institute of Standards and Technology understands cloud computing as a model for enabling pervasive, convenient, on-demand network access to a shared pool of configurable computing resources, which require minimal management effort or service provider interaction. On-demand self-service: no need of human interaction between service providers and consumers. Users can unilaterally and automatically provision computing capabilities as needed. Broad network access: Available over the network and accessible through standard mechanisms, cloud computing capabilities can be used by various client platforms, such as smartphones, tablets, laptops, and workstations. Resource pooling: Physical and virtual resources are constantly reassigned to meet consumers' demand, enabling a multi-tenant model. Customers usually don't know the location of the provided resources, which can include storage, processing, memory, and network bandwidth. Rapid elasticity: Capabilities are elastically provisioned and released according to demand. Automatic scalability gives customers an impression of unlimited capabilities, available in any quantity at any time. Measured service: Cloud systems offer metering capability, meaning that resource appropriation can be monitored, controlled, and reported. Infrastructure as a Service (IaaS): consists in the outsourcing of the equipment needed to support operations. The capability provided includes processing, storage, networks, and other computing resources in which users can deploy arbitrary software. IaaS can be of great value to businesses through a mechanism known as cloud bursting, or the off-loading of tasks to the cloud. In the IaaS model, customers pay on a per-use basis and eliminate the need for investments in additional servers. IaaS is an evolution from the previously dominant concept of "infrastructure as an asset", in which companies gained competitive advantage by investing in bigger, faster, and stronger infrastructures than their competitors. The new paradigm helped overcome significant inefficiencies, such as the costs associated with large data centers, the manpower required, and the wasteful consumption of energy. Platform as a Service (PaaS): is the model through which users can leverage the computing resources of the cloud. It allows developers to build and deploy applications on a hosted infrastructure. Instead of going through the often problematic task of setting up the server environment that will host the application, when using PaaS, developers have a virtual machine that contains the entire server environment and can fit into a USB flash drive. PaaS consists of two components: a computing platform, or the platform on which a software is built to run, and a solution stack, or the applications that assist in the development and deployment of the software, such as the operating system, run time environments, source control repository, and any other required middleware. Software as a Service (SaaS): is a model in which users have networked, cloud-based access to software. Popular examples include Netflix, Gmail, Google Docs, along with a major share of mobile applications. While businesses can profit from the SaaS "on-demand" model by eliminating the need for multiple licenses, software vendors enjoy increased speeds of deployment, higher user adoption, reduced support requirements, and lower implementation costs. Traditional software providers have been faced with the challenge of enabling desktop applications to run as SaaS, which often requires re-writing. A common solution has been the gradual transition to the cloud, with the launching of scaled-down versions of the original software. The so-called freemium services, in which scaled-down SaaS advertise licensed software products, have been largely adopted. An interesting example is Adobe's Photoshop.com and Acrobat.com. SaaS has driven significant innovation in application and user interface design, which begins to incorporate a user experience approach. Likewise, this new delivery model has led software developers to adapt their skill sets in order to remain in demand as a new generation of computing programming arises. When it comes to deployment, there are also three different models in cloud computing. In a nutshell, clouds can be private, public, or hybrid. A public, or external, cloud is fully owned and provided by a third party vendor. It is located outside a company's firewall and is also referred to as a shared, multitenant infrastructure. Public clouds are available for open use by the general public, they comprise the most popular examples of cloud computing services, such as cloud storage, online office applications, and cloud-based web hosting and development environments. Differently, a private cloud is an environment located behind a firewall and dedicated to a single organization for exclusive use. It is implemented under the control of the company's IT team, offering enhanced privacy and security. Within the private cloud model, financial firms, for instance, can take advantage of cloud computing while complying with regulations that require them to store sensitive data internally. Private clouds can be hosted internally or externally, in which case they are denominated hosted private clouds (HPC). Dedicated private clouds are a type of HPC where providers offer dedicated 1:1 physical compute and storage resources focused on the needs of one enterprise. Examples of this service include Amazon EC2 Dedicated Instances, IBM SmartCloud Enterprise, Savvis Symphony Dedicated, and Rackspace Cloud: Private Edition. Finally, in a hybrid cloud a company is able to retain confidential information in a private cloud while having access to external services offered by public clouds. In this model, there is a combination of two cloud infrastructures, public and private, with data and application portability among them. The seamless integration of platforms is a means to maximize efficiencies, allying the scalability of public clouds to the security of private ones. A recent study by IT research and advisory firm Gartner predicts that, in 2017, nearly 50% of large companies will be engaged in hybrid cloud operations. Virtual private clouds (VPCs), which integrate the group of hosted private cloud services, are examples of the hybrid cloud computing model. They consist of private cloud solutions provided within a public cloud infrastructure. In a VPC the provider isolates a portion of its public cloud for private use. Though they remain under the management of a public cloud vendor, VPCs allow for the isolation of a costumer's data, which is not shared with any other tenant. The functioning of VPCs is similar to the one of virtual private networks, which enables secure data transfer over the public Internet. Amazon Virtual Private Cloud (VPC), IBM SmartCloud Enterprise Plus, Savvis Symphony VPDC/Open, and Rackspace RackConnect are examples of VPC services. The following table presents the projected growth rate for public and hosted private cloud services in the short run. * Source: Gartner, Dec. 26, 2013. Available online at https://www.gartner.com/doc/2642020/forecast-public-cloud-services-worldwide. ** Source: International Data Corporation, Feb. 28, 2013. Available online at http://www.idc.com/getdoc.jsp?containerId=prUS23972413. 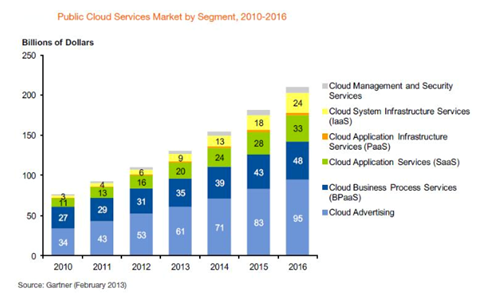 The following chart illustrates the evolution of the public cloud services market between 2010-2016. According to McKinsey & Co., the total economic impact of cloud technology is expected to be between $1.7 trillion and $6.2 trillion annually in 2025. This projection includes the surplus generated by cloud-enabled services and the productivity improvements in enterprise IT. Gartner affirms that 59% of all new spending on cloud computing services originates from North American companies, a trend expected to intensify in the near future. The cloud computing market has attracted major players. Amazon was a pioneer in remote computing services and is now the owner of the world's largest cloud computing company, Amazon Web Services. The AWS cloud hosts operations from major clients, such as Netflix and Shell. In addition to data storage, it offers a number of capabilities, such as data analysis, searching, and email service. AWS's success has been an important driver of innovation. One example is Amazon's recent partnership with Computer Sciences Corporation (CSC), a Virginia-based provider of next-generation IT services and solutions. The two companies will work together in the CSC Global Cloud Center of Excellence (CoE), to be established in Austin, TX. The objective is to provide customers with standardized solutions designed to accelerate the development, migration, and transformation of enterprise workloads to AWS, along with the integration of private and hybrid clouds in an extended enterprise environment. The collaboration aims to address the specific cloud requirements of particular industries, such as natural resources, manufacturing, banking, insurance, and public sectors. Google is yet another example of the magnitude of the cloud, which is the power behind its multiple services, such as email or photo editing. Google's search business was built upon innovative cloud techniques, including groundbreaking tools for big data analysis. The development of new cloud-related services has been a priority for Google, which recently acquired the cloud monitoring service provider Stackdriver. In only a few months, Google integrated the startup's expertise into its own cloud tools. Launched on June 26th, Google Cloud Monitoring provides developers with metrics, dashboards, and alerts for applications that run on Google's cloud, along with information on popular open source services like Apache, Nginx, MongoDB, MySQL, and Redis. Other major players in the cloud business include Apple, whose iCloud is the go-to platform for more than 130 million customers looking for an easy access to documents, music, and photos from whatever device they are on. In order to face growing competition from cloud storage services such as Dropbox, Google Drive, and Microsoft's OneDrive, Apple recently introduced the iCloud Drive. The revamped cloud service is an extension of the next generation OS X and iOS 8 (to be integrated into forthcoming updates) but it will also interoperate with Windows, via web browser. iCloud Drive will offer enhanced convenience through a number of innovative features: cloud files will be tagged, indexed, and visible to Finder exactly as local files are; mail attachments will be automatically synced to the cloud through the Mail Drop tool; and all pictures taken with Apple devices will upload automatically to the cloud for backup. Apple also announced the CloudKit, a new developer framework designed to help app creators work cloud components into their products. Cloud computing has also opened the way for a previously inconceivable multiplication of information-driven startups. An interesting example is Pinterest, which loads 60 million photos a day but has a staff of only 300 people. Similarly, messaging app Snapchat experienced a meteoric growth, reaching millions of users overnight, with minimal investment in computing support. This was made possible by Google's cloud. Cloud computing can be understood from two different perspectives: 1) a technology to enhance IT productivity, and 2) a platform for business innovation. This second dimension is key to understanding how cloud computing can foster economic growth. A recent McKinsey & Co. study points out that using cloud technologies merely as a means to improve IT productivity will not drive growth, "Investments need to go into innovation and disruptive business models. (...) Unless companies are asking themselves how to use the cloud to disrupt their own business models or someone else's, then adopting the cloud is just another IT project." Cloud innovation is intrinsically linked to the ability of delivering mass customized services via the Internet. The combination of cloud computing and mobile devices opens the way to realizing virtually anything as a service, from banking and entertainment to healthcare and education. In a recent contribution to the Wall Street Journal, Irving Wladawsky-Berger, who worked at IBM for 37 years, argued that cloud-based services, designed to reach billions of people and to connect massive amounts of sensors, require a highly standardized, mass customized, process oriented, industrialized approach to production. Innovation must focus on applying advanced technologies and rigorous science, engineering, and management methodologies to favor the emergence of this next generation of services. Cloud-based Analytics: The International Data Corporation expects the big data market to reach $16.1 billion in 2014, growing at six times the pace of the overall IT market. The organization predicts that cloud infrastructure will be the fastest-growing sub-segment of this market, with a compound annual growth of 50% between 2013 and 2017. In the era of Big Data, cloud computing has been instrumental for the processing of massive amounts of information. In other words, innovations once considered impossible are taking place due to the tremendous processing power triggered by cloud computing. Iconic examples include real-time translation applications, self-driven cars, and the emergence of the Internet of Things (IoT), in which intelligent, sensor-enabled objects gather massive amounts of data and shape their performance accordingly. The combination of big data and cloud computing is also changing the face of advertising. The ability to process huge amounts of information about customers' behaviors and desires has enabled a new wave of data-driven, personalized marketing. A growing number of companies offer cloud marketing platforms, which consist of comprehensive sets of marketing tools, including analytics, media optimization, targeting, web experience management, etc. The idea is to interpret data on consumers' preferences and deliver relevant advertising, particularly across digital channels. Examples of companies include Adobe, BloomReach, Axiom, Epsilon, BlueKai, IBM, Oracle, Salesforce and Teradata. Cloud Security: Despite a growing confidence in the cloud, security remains a major concern. An increasing number of startups are engaged in developing cloud security solutions that provide, among other tools, end-to-end encryption and authentication schemes. A recent report by market research firm Infonetics revealed that the cloud security market reached $3.2 billion in 2013. This amount is expected to nearly triple by 2017, reaching $9.2 billion. In spite of major productivity gains from cloud computing, the cloud is still more insecure than storing data on one's own premises. Stolen or cracked passwords are examples of common threats. Emerging solutions include multifactor authentication, such as the combination of passwords and one-time codes, and the monitoring of login requests. More radical options include the encryption of data even before it reaches the cloud provider. Innovative encrypting schemes developed by California-based startups CipherCloud and Voltage Security make data unreadable as it travels from employees' computers to the cloud. There is no doubt that cloud computing is a major transformational force in the IT world. In addition to enhancing IT productivity, it serves as an increasingly important platform for innovation. Companies engaged in cloud-based innovation are strong candidates to receive federal R&D tax credits.